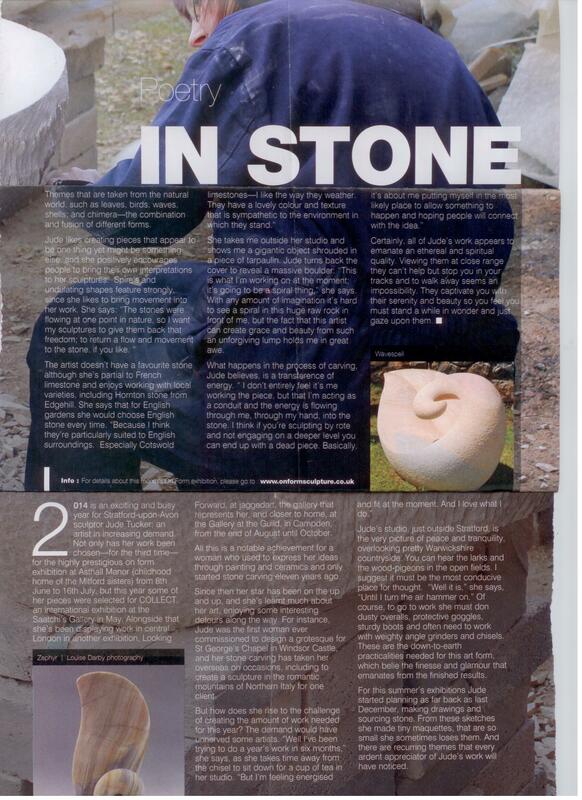 Press - on form | sculpture: the showcase for contemporary sculpture in stone at Asthall Manor, Oxfordshire. Roses at Asthall are pruned, one at a time, between late September and early March. The whole raison d'être of the garden is the bi-annual sculpture exhibition, which Rosie dreamt up with Anthony. It has proved a giant success, and has added to the gaiety of the nation. The Potting Shed Cafe is a Pop Up Cafe this year hosted by Fiona Cullinane, an inspired chef bringing her eclectic style and imaginative flare to the rural idyll. The old stone Potting Shed houses the cafe with mismatched garden furniture decorated with cheerful homegrown flowers making up the dining area; it really is like stepping into a Country Living lifestyle shoot. The Potting Shed Cafe is the pop-up restaurant to visit this summer, set in the gardens of Asthall Manor during the on form sculpture biennial. Tactile Treasures - Tracy Spiers visits the wonderful Asthall Manor on form exhibition. on form 16, the impressive biennial exhibition of sculpture in stone at Asthall Manor, Oxfordshire, is set to be the largest and most diverse yet. Over two hundred works by leading UK and international artists will be shown around Asthall Manor’s acclaimed gardens in their beautiful Windrush valley setting. 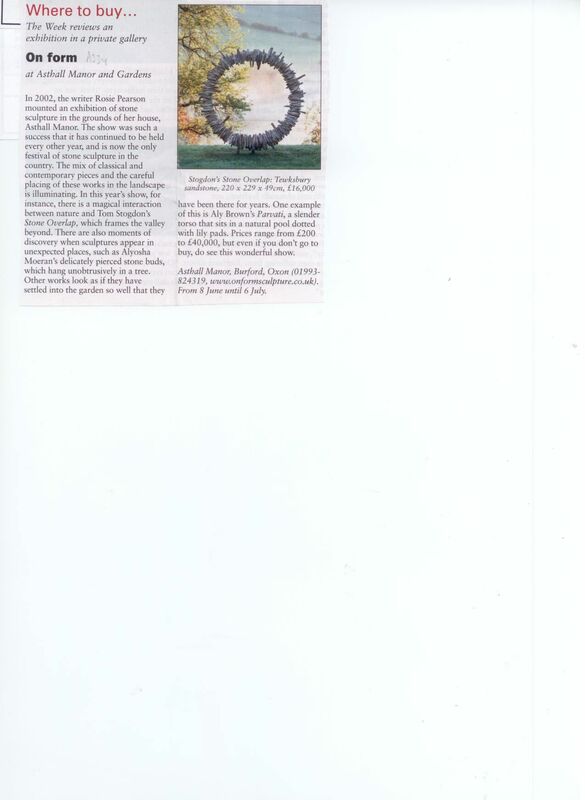 "Magnificent outdoor artworks in a quintessentially English garden.........changing perceptions is what this imaginative show is all about." In an age obsessed and even dependent on that which exists only in the digital and ‘immaterial’ realm, the physicality of stone sculpture such as Anthony’s holds a special resonance. We taught Holly to swim during picnics close to Asthall bridge, admiring as we did so the gracious lines of the former Mitford home. Later we were able to admire it from much closer to hand as the home of our friend Rosie Pearson. Every other year since 2002, Rosie has thrown open her lovely gardens (designed by Isabel and Julian Bannerman, known for their work at Highgrove House) for an exhibition of outdoor sculpture. She has just sent me a release with information about this year’s on form, from June 8 to July 6. I quote: “on form encourages visitors to open all their senses, with a ‘please do touch’ policy. Strengthening this theme, several sculptures will explore the musical sounds of stone this year, and there will be blindfold tours of parts of the exhibition in order to intensify the sense of touch. “Other innovations will include site-specific work, a performance of the art of stone balancing by Adrian Gray, and work by an exciting and diverse range of talent including Jude Tucker, the first woman to carve grotesques for St George’s Chapel in Windsor and Spanish sculptor, Jordi Raga-Frances, well known for his work at the Acropolis and at Gloucester and Canterbury cathedrals. It is early spring, a day of pale chilly sun and blackbirds in wintery beeches. The garden sleeps demurely, pruned and tied. It betrays no hint of the rebirth stirring in the soil, the explosion of exuberant foliage that is summer at Asthall Manor. Inside, the long, oak-panelled dining-room hums with the laughter and conversation of people sowing the seeds for on form 2012, Asthall Manor’s other, stranger crop – in stone. At the height of June, the fruits of this lunch will appear in the garden, with their labels like rare plants: Ancaster weatherbed, Crema Fantastica, Yorkshire mudstone, Cornish peridotite, pink Turkish onyx, Tinos green marble. Some pieces of stone have travelled continents to take their places among the borders; others are as familiar and touching as the golden Cotswold landscape itself. The artists themselves – twenty-eight in all – are as diverse a group as the materials they have chosen. Several generations are here, from new talents to famous names with pieces in collections all over the world. They work in studios under the flyover of the Docklands light railway and in rusting barns tucked into the folds of Dartmoor, on hillsides from Yorkshire to Gozo to Colorado. Some scale their pieces up from exquisite models, while others prefer to let the internal form of the rock itself be their guide; one at least builds his pieces up in layers, like dry stone walling. After spending a few days in the company of the exhibitors, however, I am less struck by their inevitable, creative variety than by the commonalities of their lives. Each of them has chosen a way of life that, despite modern tools, seems to have more in common with a stone mason of pre-industrial times than, say, an IT worker or a businessperson – or many a contemporary artist. Such are the particularities of this existence that I find myself wondering which, in the human-stone dynamic, is being sculpted, and which is doing the sculpting. Watching one of the artists painstakingly sanding a huge slab of Kilkenny limestone, it dawns on me that the more malleable element is never going to be the rock. When the pieces are gleaming in a green shade at Asthall Manor, it will take a mental wrench to recall this moment in their creation. At one level, all the sculptors agree, carving in stone is tough, monotonous manual labour. ‘Very boring,’ says Bridget McCrum briskly, of the first stage of a sculpture when the form is being blocked out in stone. The noise, the goggles, masks and ear-defenders that constantly get clogged up with dust and filth, the winters that make tools so cold they burn your hands, the bad backs – let alone the spectre of lung disease from the dust and white finger from the power tools – in these ways and many others, the stone chisels away at those who would shape it. ‘Believe me, it’s not romantic,’ Jordi Raga remarks. The relentless solidity of stone in itself weighs down on the life of a sculptor. ‘A lot of it is about problem-solving,’ explains Ekkehard Altenburger. Besides the main problem, of summoning form out of the rock, sculptors are faced with the daily struggle of rotating these vast chunks of material, moving them to and fro to catch different light, pinning them onto bases, transporting them, installing them… Equipment must be devised and endlessly adapted, tools must be developed, wooden crates built. It is a daily round of tasks far removed from that of the ethereal, impractical artist of popular imagination. Such moments of transcendence are hard-won. Even stone-workers cannot achieve joy all the time: every sort of humdrum pressure is waiting at the doorstep of the studio to harass and hurry them. At the end of the day they are filthy and aching in every muscle. Yet behind them the work remains, evidence of the moment when an inert mineral, the greedy recipient of all that the artist can give – their energy, time and intention, their love – takes an invisible breath and lives. This is the stone you see at on form, filled drip by drip with a mysterious life-force, like the riot of greenery around it. A sight for commuters’ sore eyes on Marylebone Road — a crop of sculptures has arrived at St Pancras Church crypt and gardens. They are part of the Onform biennale show, usually held in the grounds of Asthall Manor in Oxfordshire, once the home of the Mitford sisters, but this year also taking a month’s sojourn in London. Visitors are encouraged to feel the works by sculptors including Simon Hitchens and Lucy Unwin. The exhibition’s curator Anna Greenacre noted shouts of approval from passers-by as the pieces were installed, while Onform’s founder Rosie Pearson applauds stone for both its aesthetic and handy functions. (June 2013) Works of 19 sculptors, among them Bridget McCrum and Peter Randall-Page, will be exhibited in the Crypt Gallery at St Pancras Church in London until June, 26. The works are showcased at the onform exhibition which usually takes place every two years at Asthall Manor in Oxfordshire and now for the first time has come to London. Creating both figurative and abstract works, the collection of artists carve in a rich variety of stone sourced from all over the world, including dark grey Kilkenny limestone, honey coloured calcite, Italian blue alabaster, red sandstone and grey-white Carrara marble. The sculpture selected for onform london ranges in size from desk top pieces to much larger works for outdoor display. The artists are: Peter Brooke-Ball, Katusha Bull, Aly Brown, Frederic Chevarin, Luke Dickinson, Simon Hitchens, Jonathan Loxley, Bridget McCrum, William Peers, Peter Randall-Page, Jordi Raga Frances, Julian Rena, Rachel Schwalm, Sarah Smith, Guy Stevens, Anthony Turner, Lucy Unwin, Paul Vanstone, Dominic Welch. Stone sculpture is weird. The words conjure up old English churches and images of an ice sculpture festival without the fun. In reality, one quick look at onform will tell you something different. It’s Britain’s most acclaimed stone sculpture exhibition for a reason and it’s also the only one of its kind. After a series that ran in Oxfordshire, housed in a fittingly smart manor, the exhibition comes to the capital for the first time. Find 129 sculptors on show, with new and established talent. The names of the likes of Bridget McCrum and Peter Randall-Page will mean more to some Londoners than others, but the work on show is varied, and startlingly impressive. Held in the fitting Crypt Gallery (quickly becoming one of our favourite exhibition spaces), it’s raw nature, in two ways. Find out how interesting the earth can be when man plays with it. Described as the country’s most seductive sculpture display, the sixth onform, last year, was the most successful edition yet of a group show held at Asthall Manor, in the Cotswolds, ever since owner Rosie Pearson commissioned two gatepost finials from artist Anthony Turner in 2002. Turner is one of 19 artists taking part, having originally inspired Pearson to fill the garden with similarly striking, curvy stoneworks. Overseen by co-curator Anna Greenacre, the switch to London aims to create a deliberately urban contrast to its usual home, although it remains dedicated to tactile, engaging pieces which respond playfully to the atmospheric crypt and one another. That philosophy makes for a diverse line-up. Peter Randall-Page, whose influence resulted in a major show at Yorkshire Sculpture Park three years ago, is among Turner’s fellow artists, as is Bridget McCrum, who takes inspiration from the hills of Devon but, in her largest work to date, made a conversely fearsome stainless steel representation of the Merlin bird and the Spitfire, commissioned by Rolls-Royce. Open 11am-6pm (4pm Saturday and Sunday, closed Monday). Admission free. Follow @AsthallManor on Twitter. THE UK’s largest exhibition of sculpture in stone, On Form, is set within the gardens and ballroom of Asthall Manor from June 17 to July 15. As part of a lively and varied programme of events, On Form 2012 will also feature a drop-in performance, Scary Little Girls: The Speaking Stones on June 23. Following the success of their Living Word Walks in Chipping Norton and Didcot, artist led theatre production company Scary Little Girls will create a unique performance that allows the sculptures to share their secrets. Responding to the art and to the environment, the evening includes the work of poets who have a connection with art, nature and psychology, such as Thomas Hardy and John Keats, alongside that of contemporary poets such as Peter Redgrove and Penelope Shuttle. on form has since 2002 presented a show whose focus and dedication is in a different class from the potpourri of conceptual installations elsewhere. on form is a serious, committed, intellectually adventurous biennial exhibition of stone sculpture, the largest of its kind in the UK. In this Jacobean house with acres of gardens and yew walks, orchards and lakes, Pearson showcases two dozen of the most accomplished artists in this difficult but compelling medium – by which heavy inert rock is transformed into something dynamic, and our connection with landscape and nature re-affirmed. Some are well-known. Emily Young’s wonderfully luminous pierced discs and pared-down, silent figures; Peter Randall-Page’s delicate balance between geometry and the random vagaries of stone markings; Bridget McCrum’s abstracted animals. 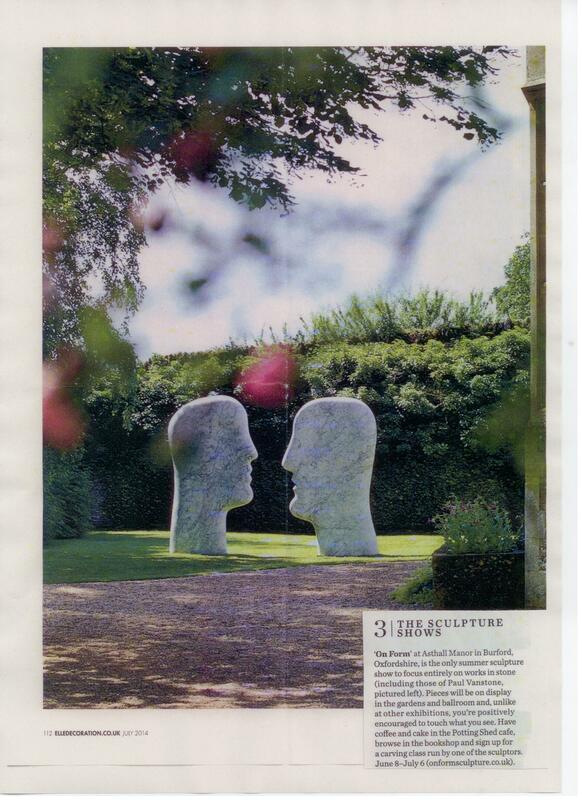 Among younger artists, Paul Vanstone’s huge expressive heads, Luke Dickinson’s abstractions on the theme of movement and growth; the raw surface textures and solemn serenity in the work of Simon Hitchens….are notable, though at Asthall there are always new discoveries. “Do touch” the signs read, inviting tactile experience of the shapes, textures and temperatures of exotically named stones – Swaledale fossil, Plumpton red, Ancaster weatherbed, Portuguese Estramoze – as well as the material’s timeless, time-arresting quality. The moment you enter the main gates of Asthall Manor, near Burford, passing the two gatepost finials created by sculptor Anthony Turner, you will be aware that you are entering an enchanting world where old and new not only complement each other, but provide a never-to-be-forgotten magical mix. This family-friendly show encourages visitors to touch the sculptures and explore the shape and texture of the pieces. The show has become a hotbed of inspiration for buyers and potential patrons, many of whom go on to commission works from artists whose work they have seen here, carefully sited in the glorious Cotswolds setting. Asthall Manor in the Windrush Valley, once home to the Mitfords, now forms the backdrop to a sculpture festival [which] has done more to promote the wonders of sculpting in stone than any commercial art dealer. BBC Oxford featured our first day of installation on the evening news. on form, an outdoor biennial of some 40 pieces in the garden, is now in its eighth year and steadily gaining gravitas. The stony theme is strictly adhered to, which weeds out less committed sculptors; you have to be dedicated to stand in a freezing shed with hammer and chisel chipping away at a piece of marble. Many visitors come to see the Mitfords’ old home, but are converted to this genre and find themselves caressing curves of Purbeck stone or Plumpton red. A unique showcase for stone sculpture in Asthall Manor’s fabulous gardens. It has a timeless air, yet within this tranquil and quintessentially English space sits a collection of stone sculptures that simply beg to be touched and admired. …Bridget McCrum’s superb Mythical Horses, carved out of Kilkenny limestone, appear to be struggling to rise from the earth in which they are buried. Stone sculptures that seem to slow time down. Rosie found herself taking on “a sort of mission” to convert people to the beauty of contemporary sculpture in stone…At first, the main attraction for visitors was to look at the house…. [but] the sculptures are increasingly becoming the main attraction. This year…among the exhibits will be an iconic pierced disc of chalcedony by Emily Young, Bridget McCrum’s elegant abstracted animal forms and Paul Vanstone’s sophisticated stone renditions of Greek-inspired drapery. Summer always brings with it the pleasure of looking at sculpture out of doors and there can be few more idyllic settings for it than Asthall Manor in the Windrush Valley, arguably the most beautiful river landscape in the Cotswolds. on form has established an enviable reputation among such shows for its range and adventurousness in the 4 years of its existence, and this year’s version is no exception, with Anthony Turner, Nicolas Moreton and Mat Chivers particularly catching the eye. What better way to discover fresh works of art than on a stroll through the gardens of Asthall Manor? The house, once the home of the Mitford girls, is the perfect backdrop for large-scale forms. Anyone with any doubts about modern abstract sculpture should visit on form in 2008 to experience the amazing mutual flattery of stone and flowers.